The health sector spans public health work, the NHS, NHS commissioned services and Clinical Commissioning Groups (CCGs), GP surgeries and new initiatives such as social prescribing. 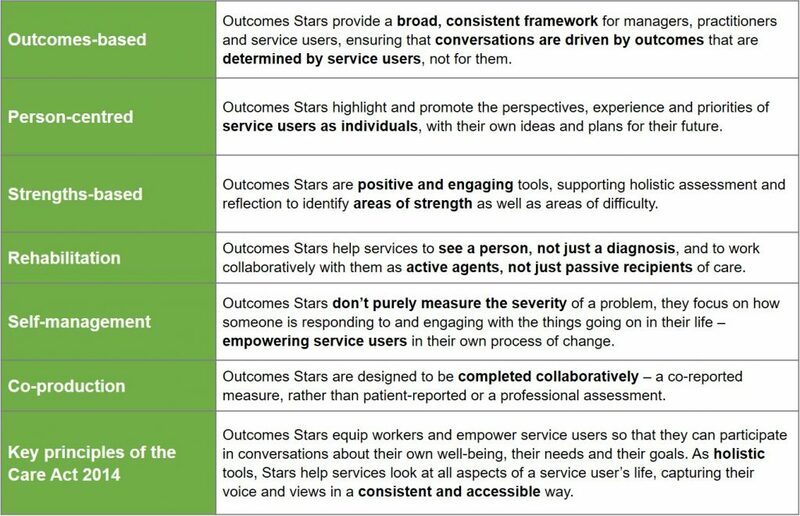 The Outcomes Star can play a useful role in self-managing of long term health conditions as well as more generally in embedding person centred planning and measuring of non-clinical outcomes. Read our case study demonstrating how the Well-being Star can be used across a variety of health settings. The Well-being Star is a short and simple to use tool designed for use with adults living with long term health conditions and aims to support people in self-management of their condition where possible. The Support Star (Young People) helps young people facing serious illness to talk about the impact of their illness on different aspects of their life and identify any support they may need. The Support Star (Parents) is designed for use with parents of younger children facing serious illness. The Sexual Health Star has been specifically designed for work with young people and their sexual health. It is a holistic tool looking at various areas of a young person’s life, but with a focus on enabling young people to have good sexual health.